Two action packed days of racing in the wind chilled dust of Loveland, Colorado determined the next fleet of 2012 State Champions and brought an end to the cyclocross season. Shucks. Right when things were really getting fun and the weather was really dropping into the twenties and more snow was on the way. Cyclocross is one of those sports where you don't expect or even want good weather. As if jumping, running, hopping, falling and pedaling over anything thrown in your path isn't enough, poor weather makes a cyclocross race even more exciting to watch. 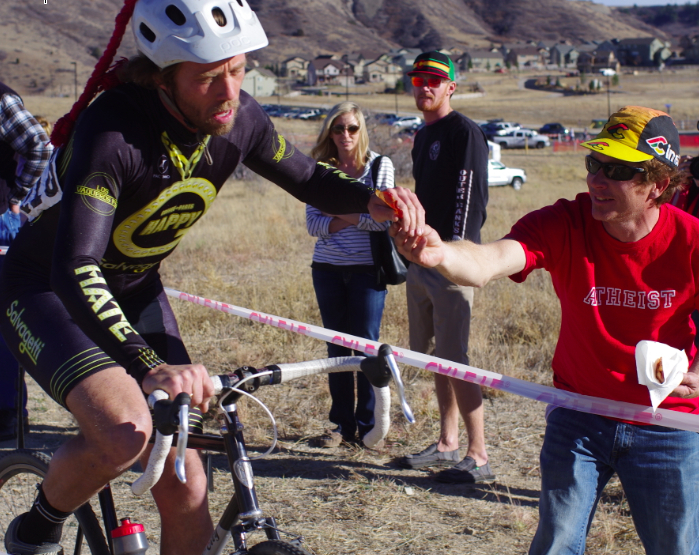 This year the Colorado State Cyclocross Championships (Cross of the North) was cold dry and dusty. I get asked this question a lot, even though I don't race it, I watch it. 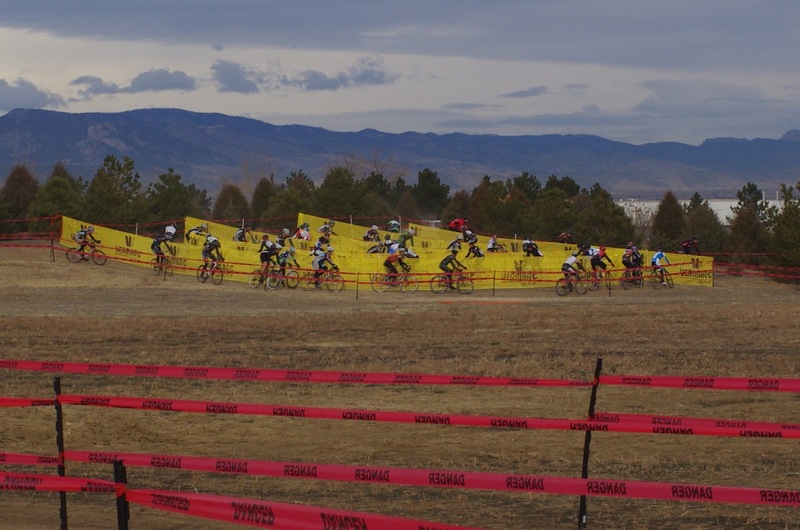 In Colorado, I believe Cross Season is the season of bike racing. Cyclocross is a form of bike racing on mixed terrain, raced outside in the fall and early winter. If you really want to know, Wikipedia will give you some basic cyclocross history. Or read a little more at CyclingRevealed.com. If you really want to keep up on the sport, become a regular reader of Cyclocross Magazine. Cyclocross is not road racing, or mountain biking, or bicycling, it is Cyclcross or CX. Riders are known as "cross racers," not cyclists. They are not even "riders" (as they are called in road racing) because they barely have time to ride with all that racing going on. Being at a cyclocross race is a surprisingly low-key and fun event with plenty of non-stop action. Cross racers look like this in very nice one-piece skinsuits; a reason why the Colorado CX season should end one week before Christmas. For a sport with seemingly few rules, there is indeed a UCI Cyclo-cross Rule Book. I can save you some time by offering these tips: pre-register or don't, either way is controversial. Don't come to the start line unless called, if no one calls your name start from wherever you are and pedal like mad or you will have a LOT of people to pass. Don't go outside the lines. Lines are important in cyclocross, and because your brain is operating on low oxygen from the exertion, they tape or fence you into the course restricting your path so you have no choice but to pedal straight ahead. They don't even expect you to follow a map or count laps, they ring a bell really loud on the last lap then yell at you to get off the course, at which point you may stop, hopefully before getting lapped by the winner. In the wet and cold sections of this country smart people have adopted a sport popular in Europe and the UK for over fifty years (or 100 years, cyclocross is an inexact science). Cyclocross fills those winter months between the road and mountain biking seasons offering an only slightly more aesthetic alternative to indoor spin classes. Cyclocross is a fine excuse to get out and race against your friends. You don't have to have the perfect bike, or the perfect clothes or the perfect anything, you just have to be willing to rise early and show up ready to race. You get on your bikes and race around on a few-mile course that wraps around, up and over grass, pavement, woodland, sand, cement, boards, stairs, and occasionally people. You go and go until a bell sounds indicating the last lap has been achieved within a set period of 40-60 minutes of racing. By then everyone is spread out all over the hillside and you have no idea who just won, nor do you really care, unless it was you. You immediately find your friends, most of whom you willingly trampled over on your path to victory, and re-enact every turn and fall as if you were the only one in the race. Quite satisfying. Spectators add to the style and scene of cyclocross. The sport is wildly popular in Belgium and in Oregon where fans turn out in the many thousands and hundreds respectively. Here is Colorado a few friends and a couple dogs will show up for races. However the racers marry so that more people will come watch them race, and have children to make more little cyclocrossers with the purpose to grow the sport. Or so it seems. The "hand-up" is a long-held tradition of cyclocross. Why spectators feel the need to hand something to a rider already struggling with jumping on and off a bike, I do not know. Coupled with cowbells, horns, and heckling - hand-ups are the ultimate entertainment of the spectator. Beer handups are tradition, but in Las Vegas at Cross Vegas (Cross Vegas - Vegas style), money is handed up to the riders, and that money originates in all sorts of places where some dare not tread. There is even evidence of a pickled herring handup in Chicago. This year Colorado favored the classic bacon hand-up. These are cyclocross bikes. Not a mountain bike, not a road bike, cyclocross bikes have slightly wider tires with equipment able to tolerate mud and snow while light enough to carry on one's back. Cyclocross is a perfectly beautiful reason to construct or buy an entirely new bike. And a new bike is always a good thing. First thing to know about cyclocross is it is supposed to be fun. Fun is the one word I hear often after a race. I fight the instinct to flee when a sweaty, slobbering, muddy rider approaches after a race because I know the chances of hearing "that was fun," are likely and worth it. That is the whole point of being at a cross race - fun. Little kids do cyclocross too. They categorize racers into age groups, otherwise there would be no telling the kids from the adults because all the riders are out there falling and jumping around in the dirt and calling it a sport. The next thing to know about cyclocross is you need to be fit. Unless you don't really intend to race (video), or are a spectator in which case you just need to have excellent heckling skills, ability to ring a cow bell loudly, good taste in beer, and the ability to digest barbequed sausages. But to race a cyclocross race you must be impermeable to the elements, able to race through the echos of insults, think clearly after spiking your heartrate to an unimaginable recovery level, and never ever give up. Ever. 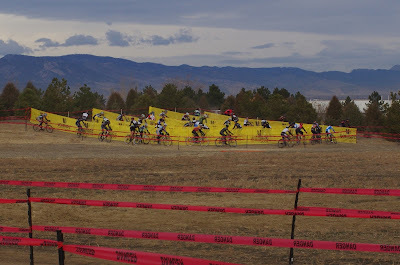 Here is my summary highlights of photos from Day 1 at Colorado CX State Championships, Cross of the North, in Loveland, Colorado this past Saturday. My fancy yet brief slideshow here: Colorado CX State slideshow by Karen at Pedal Dancer. If you want to see more pictures from the pros, visit the list of photographers on 303Cycling.com, they are good. There are also some videos on their website, including this really good video by Jamie Servaites of the Mens Open race. This year Yannick Eckmann won the Mens SM Open Category. I wrote a piece on a young 19-year old Yannick last year: A study of Yannick Eckmann. And this is a video of Yannick winning a race in 2011 in Boulder, Colorado (he is fast). Cyclocross season in Colorado runs from September - December every year. All ages welcome. For an event schedule please visit: Bicycle Racing Association Colorado Race Events. Cyclocross Nationals consist of riders from Oregon, California, North Caroline, Michigan, Wisconsin, other cold states and Colorado, a state which tends to proudly dominate. It's not too late to take in some cyclocross racing online. Cyclocross Nationals are January 9-13, 2013 in Madison, Wisconsin CX Nationals website. Cycloscross Worlds are being held in the United States this year, February 1-3, 2013 in Louisville, Kentucky CX Worlds website. Yes there is a world champion of cyclocross, the current title holder is 26-year old Niels Albert of Belgium. Sven Nys of Belgium is currently leading the world rankings for the 2012/2013 season, a fierce competition will surely unfold in Kentucky. The CX world champion woman is Marianne Vos of The Netherlands, although Katie Compton of the USA is currently ahead of Vos in the 2012/2013 rankings.The current American National Champions are Jeremy Powers (Rapha-FOCUS) and Katie Compton (Trek Cyclocross Coalition). Katie has won that title every year since 2004 except 2011. Wow. On the day of the races please check in with www.cxmagazine.com for news and www.cyclingfans.com for a live race feed. The beauty of Colorado Cyclocross - I was kidding about the spin class comment above, but you probably figured out I was kidding about most of this post. Happy Holidays!